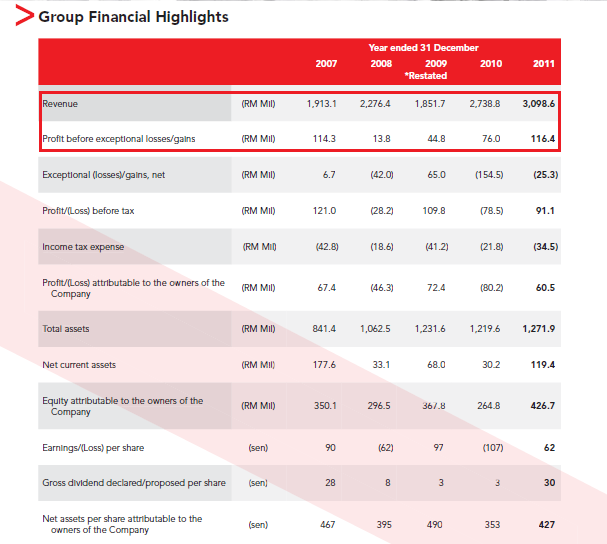 SERIOUS Investing: Malaysia Smelting Corporation: This is not a hollow tin company! Malaysia Smelting Corporation: This is not a hollow tin company! A Malay proverb - How does a hollow tin can sounds like? Loud but hollow (no substance). Malaysia Smelting Corporation ("MSC"), the 125 year old tin producing company is not one though as it changed its focus few years ago. Since 2009, it has decided to only concentrate on tin both upstream and downstream. It has decided to let go of its other investments in the form of copper, coal and gold mines. Not a wrong move as tin is what MSC does best. arm under the Smelting Division. The downstream unit provides the Group with hedging, pricing and marketing linkages to the KLTM/LME markets as well as the end-user markets worldwide. The Malaysian (MSC Straits Refined Tin) and Indonesian (Koba) tin brands are LME/KLTM registered. Tin was the metal which made Peninsular Malaysia as a popular destination back in the 19th century for miners. Since then, as applications for tin reduced due to other types of material being preferred for the food packaging business, this metal lost its glitter over time. So, what are the applications for tin in current times? Electronics industry is the main contributor. Tin is used in many alloys, most notably tin/lead soft solders (50% of usage for the industry), typically containing 60% or more of tin. Another large application for tin is corrosion-resistant tin plating of steel. Tin-plated metal is also used for food packaging, giving the name to tin cans, which are made mostly of steel. There is no doubt MSC being a very experienced integrated tin producer would have an advantage with its network of contacts and experience. How would that translate into an advantage for MSC? Production from the largest tin producer, Yunnan Tin in China steadily reduced over the last 4 years while production from the MSC's portfolio of mines continue to be steady. On the other hand, demand for tin as applications for soldering for the electronics industry continue to improve slowly but steadily. deposits located in remote locations and at greater depths. It is therefore crucial that MSC as a Group is able to apply the industry’s best practices and technologies for exploration, mining and processing of the tin resources in order to deliver on long term sustainable performance. Note that the Top 6 producers controls 65% of the tin production. For those who have read this, don't stop here. You may find something interesting in this industry and company where for most investors would have already taken a pass long time ago. We may have found a jewel here. The writer starts to feel that most politicians are just an "empty tin" - lots of promises but just hollow. There are others cheaper than Digi - So? How deep is Green Packet's problem? Quite!